2 Master Instructors + 2 Jewelry Making Techniques = 1 Amazing Bracelet workshop! Students will begin the day by working with Master Art Clay Instructor, Jackie Truty, where they will each discover how much fun it is to carve their own unique design, and then transfer it to Art Clay Silver. Next comes learning how to set a sparkling CZ gemstone into that design, and firing and finishing it before a 1 hour lunch break. 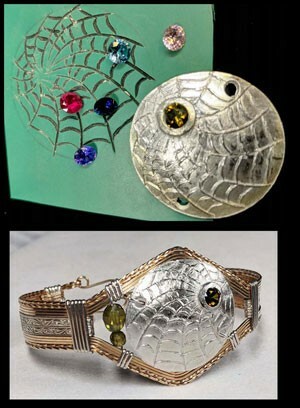 After lunch students will work with Master Wire Jewelry Instructor, Dale Cougar Armstrong, to incorporate their special solid silver disc into a designer bracelet. Using a combination of 14kgf, sterling silver, and pattern wires, each student will choose how to accent their creation as the bracelet evolves. Different variations of the bracelet pattern will be shared, as well as how to easily re-size it. The class fee includes teacher fees, all necessary precious metal wires, CZ gemstones and beads, Art Clay Silver, linoleum, use of tools, kilns, and materials while in class.